Martin Truex Jr. has been the surprise of the 2015 NASCAR Sprint Cup Series season. Not expected to even make the Chase for the NASCAR Sprint Cup at the beginning of the year, Truex has proven to be a legitimate championship contender. The driver of the No. 78 Chevrolet for single-car Furniture Row Racing out of Denver, Colorado has led the most laps in each of the past four races and finally captured his first win of the season at Pocono Raceway last weekend, speeding away from reigning NSCS champion Kevin Harvick and wins leader Jimmie Johnson on his path to Victory Lane. Truex carries the momentum from his Pocono triumph into Sunday’s Quicken Loans 400 at Michigan International Speedway (1 p.m. ET on FOX Sports 1). The New Jersey native has never won at Michigan, but he does have three top 10s at the two-mile track, including two second-place showings in 2007 and a third-place finish in 2013. As Truex acknowledged, there is plenty of season left – 12 regular season races and the 10-race Chase. Still, he has produced a banner year so far by anyone’s standards. Truex ranks second in the NASCAR Sprint Cup Series standings, 39 points behind Kevin Harvick. His 13 top-10 finishes tie Harvick’s total for the series’ most. To put Truex’s number of top 10s into perspective, in NSCS history only Lee Petty (1954, 1959), Richard Petty (1969), Truex and Harvick have collected 13 top 10s through the first 14 races. Truex has performed even while facing adversity off-the-track as his long-time girlfriend Sherry Pollex recovers from ovarian cancer. He has praised Pollex’s strength and asserts their off-the-track struggles have made him a better person. Truex believes his No. 78 Furniture Row Racing team can win the series championship. “Right now (we’re) as good as anyone out there,” he said. “Look what we’ve done the last four weeks. We’ve went head-to-head with the big guys, the 48 (Jimmie Johnson) and the 4 (Harvick), who have been the guys to beat for a year and a half. The 48 has been the guy to beat for seven, eight years. We’ve been right there with them, toe-to-toe. Chris Buescher hasn’t seen anyone ahead of him lately. And he’d like to keep it that way. The No. 62 Roush Fenway Racing driver has won two of the last three NASCAR XFINITY Series races and has climbed to the top of the driver standings, 15 points ahead of Ty Dillon. Buescher will try to continue his smooth start in Saturday’s Great Clips 250 Benefiting Paralyzed Veterans of America at Michigan International Speedway (1:30 p.m. ET on FOX Sports 1). The Texan faces added pressure since MIS is the home track of team owner Jack Roush and his car manufacturer Ford, but he has done well at the two-mile oval previously. In two career XFINITY Series starts at Michigan, Buescher has finished seventh and 10th. He will attempt to add to RFR’s legacy that includes a track-record five wins. 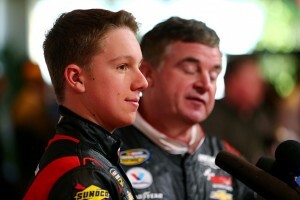 One day following his 18th birthday (June 11), John Hunter Nemechek will settle back in the driver’s seat of the No. 8 NEMCO Motorsports Chevrolet for good. Nemechek, who has been sharing seat time with his father Joe in the No. 8 truck, will grow old enough to be eligible to finish the remainder of the NCWTS schedule beginning in Saturday’s American Ethanol presents the Drivin’ for Linemen 200 brought to you by Ameren at Gateway Motorsports Park (8:30 p.m. ET on FOX Sports 1). The NASCAR Next member will spend his first day as a legal adult, not celebrating, but doing what he does every day – improving himself as a race car driver. If Nemechek races as well at Gateway on Saturday as he did last season, he has a very good chance at visiting Victory Lane. He led 53 laps before a late spin relegated him to 15th. In the process he drew praise on Twitter from NASCAR Sprint Cup Series stars Tony Stewart, Dale Earnhardt Jr. and Danica Patrick. “How cool is it watching @JohnNemechek leading at Gateway in the @CampingWorld Truck Series race! Go get’em kid!, Stewart tweeted. Nemechek, who will be competing in his third race this season feels ready to attack the 1.25-mile track. “Last year at Gateway we ran very well,” he said. “We made huge improvements from hitting the fence in the first lap of practice to contending for a win. We had an unfortunate event that happened at the end of the race that put us out of contention, but I’m really looking forward to going back this year. It’s a very fun place. Both corners are different so you have to get you’re truck handling in both. What To Watch For: Martin Truex Jr. goes for his second straight victory after first win of season at Pocono … Jeff Gordon searches for his first victory of the season as he returns to Michigan as its last race winner … Kevin Harvick attempts to continue his record 10 top-two finishes through 14 races … Greg Biffle – the active Michigan wins leader with four – tries to get Roush Fenway Racing its first victory since last June … Brad Keselowski heads to his home state in search of his first win there. What To Watch For: Kyle Busch returns to the No. 54 after 11 races out of the seat … Chris Buescher can win his third race in the last four events and increase his series points lead … Four different drivers have won the last four races at Michigan. Will we see a fifth? … Danica Patrick makes her broadcast debut as the fifth and final driver analyst to join the FOX Sports 1 booth this season. What To Watch For: NASCAR Next member John Hunter Nemechek makes his first start as the full-time driver of the No. 8 NEMECO Chevrolet … Matt Crafton continues his quest for a three-peat as he tries to add to his career-best total of three season wins … A new winner is guaranteed this weekend at Gateway.